We are the leading manufacturer of veterinary formulations for different species like Cattle, Goat, Pets, Calves, Horse,Buffalo, Camel, Poultry, Pig, Sheep, Swine, Calf etc. Water For Injection BP Q.S. ABXOL is indicated to aid in the treatment of catarrhal inflammation of bronchi and the upper respiratory tract in Horses and Dogs. Ocular Infections : purulent conjuctivities,hypopyon. Administer ABXOL by Intravenous Injection. ABXOL is a mucolytic expectorant. Ambroxol is an active metabolite of bromhexine and acts to reduce the viscosity of tenacious mucus secretions by fragmentation of long mucopolysaccharide chains,resulting in a productive cough which aids expectoration of liquefied mucoid respiratory secretions and assist in clearing and maintaining patent bronchioles and alveoli hence reducing dyspnoea.ABXOL enhances the concentrations of chemotherapeutic agents in bronchial secretions to result in a more rapid recovery. 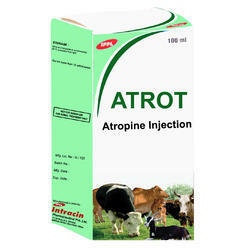 ATROT Injectable Solution is used as a spasmolytic in painful conditions of animals and also for decreasing salivation and bronchial secretion during surgeries under anesthesia and as pre-anasthetic substance for preventing adverse effects on increased vagal tonus on heart (together with analgesic drugs before anesthesia particularly in traumatized Cats and Dogs). Moreover, it is used as an antidote in toxicities of insecticides with organic phosphor or in the carbamate group as well as in and eserin, pylacorpin, arecholin and chloroform toxicities. Practical Dose : It should be administered via subcutaneous route for parasempatolysis. It is administered at doses mentioned in the table below for target species. In the first day of the treatment,two-fold of the doses mentioned below are administered to target species and in remaining days,it is administered at doses mentioned below. Note :If it is used as an antidote, it should be administered slowly via Intravenous route in toxicities of organic phosphorous or carbamate group insecticides.It should be administered via subcutaneous route in other toxicities. Cattle, Sheep and Swine kept for meat should not be sent to slaughter throughout the treatment and within20 days following the last drug administration.Following antimuscarinic dose, Cattle and Sheep kept for meat should not be sent to slaughter for 14 days following the last drug administration. Milk obtained from Cattle and Sheep throughout the treatment and within 4 days (8 milkings) following the last drug administration should not be offered to consumption by human. Prevention and treatment of hypocalcemia, debility, weakness to improve health , productivity and milk yield. 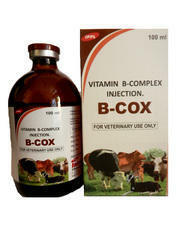 Horse & Cattle : 10 - 20 ml / day for 3 to 5 days. It is indicated for theileriosis(East Coast Fever,Corridor Disease,Zimbabwean Theileriosis,Tropical Theileriosis)caused by intracellular protozoan parasites Theileria parva Theileria parvabovis,Theileria parva lawrencei,T.annulata,T.mutans and T.orientalis sergenti in Cattle.It is active against both the schizont and piroplasm stage of Theileria spp.,and may be used during the incubation period of the disease or when clinical signs are apparent. 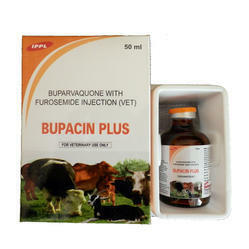 A single dose of 1 ml BUPACIN Injection per 20 kg bodyweight. (2.5 mg buparvaquone per kg bodyweight). In severe cases the treatment may be repeated within 48-72 hours. Not more than 10 ml should be injected into a single site. Successive Injection should be administered at different sites. Intramuscular Injection into the neck muscles. Due to the inhibiting effects of theileriosis on the immune system, Vaccination should be delayed until the animal has recovered from theileriosis. Injection by the Intramuscular route into the neck muscles at the rate of 1ml/20 kg(2.5 mg per kg of buparvaquone and 2.75mg/kg of furosemide)Repeat after 48 hours In cases of exceptionally severe infections with pulmonary oedema,further treatment at half the dosage rate may be required at 24 hour interval . For the treatment of theileriosis ( east coast fever )particularly for advanced cases with pulmonary oedema Buparvaquone kills theilerial schizonts (in lymphoid cells )and piroplasms ( in red blood cells ) and it supresses preschizont stages during the incubation period of disease Buparvaquone kill the parasite through its actions on their mitochondrial electron transport (respiratory) system.Furosemide is a diuretic ,which resolves pulmonary oedema . Localised swelling may occur at Injection sites but it resolves in a few days.BUPACIN PLUS is very safe so overdosage is unlikely to cause significant adverse effect .BUPACIN PLUS must be administered only by the Intramuscular route.Intravenous Injection may cause severe shock BUPACIN PLUS is poorly mobilised after subcutaneous injection and its curative effect is greatly reduced.Furosemide is chemically similar to the sulphonamides so BUPACIN PLUS should not be used in animal with sulphonamide sensitivity. 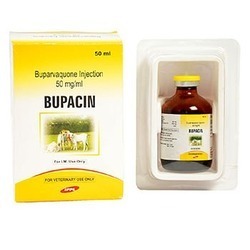 Milk for human consumption should not be taken from animals treated with BUPACIN PLUS until atleast 48 hours after treatment.Milk for animals treated with BUPACIN PLUS is safe for consumption by calves.Animals should not be slaughtered for human consumption until at least 42 days after treatment with BUPACIN PLUS . BUTACIN is indicated for debilitation by acute or chronic metabolism disorders that result from poor nutrition, inadequate management or disease (e.g. developmental and nutritional disorders in young animals due to rearing disease, and (secondary) ketosis in cows). It can be used for metaphylaxis of infertility, puerperal diseases and in support of sterility treatment. It acts as a roborant in cases of stress, overexertion, exhaustion and reduced resistance,and as a tonic in cases of weakness, secondary anaemia and chilling.BUTACIN additionally supports muscular physiology, the treatment of infertility, and tetany and paresis as an adjunct to calcium and magnesium therapy. - In cases of chronic disease : half the dose at intervals of 1 - 2 weeks or less. - In healthy animals : half the dose. 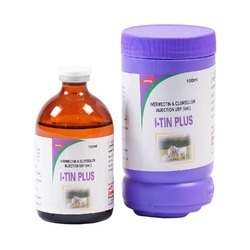 For the treatment of mixed trematodes (fluke, amphistomes) and nematode or arthropod infestation due to Gastrointestinal roundworms,Lungworms, Eyeworms, Warbles, Mites and Lice of dairy animals. Ivermectin and Closantel Injection should be administered at a dosage rate of 200 mcg Ivermectin per kg bodyweight add 5 mg Closantel per kg bodyweight (1 ml per 25 kg) it should only be injected Subcutaneously into the neck. maximum dose of 10ml should administered at any one site with any residual volume administered at another site in the neck. 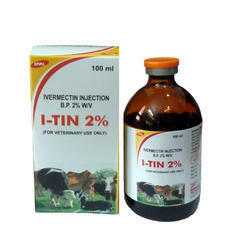 Ivermectin and closantel Injection is not for Intravenous or Intramuscular use.Do not use in non-lactating dairy Cows including pregnant heifers within 60 days of Calving.Does not use in cases of know hypersensitivity to the active ingredients. For treatment and control of Gastrointestinal immature and adult roundworms. Lung Worms : Both adult and Fourth - Stage larvae of Dictyocaulus viviparous. Liver Flukes : Immature and adult Fasciola hepatica & Fasciolagigantica. Eye Worm : Thelazia app. Ectoparasites (Dermatobiahominis,Psoroptesbovis)Including Sucking Lice, Ticks & Mites. Administration to lactating animals and pregnant heifers within 60 days of Calving.This product is not for Intravenous or Intramuscular use. Do not administer to lactating animals. Administer by Intramuscular Injection regularly twice weekly advised by a Veterinary surgeon. Vitamin B12 is essential B complex vitamins, vitally involved in many critical metabolic processes related to coenzymes for tissue formation,DNA synthesis, complete utillisation of carbohydrates and proteins for nervous tissue maintenance and energy production, and blood counts.Vitamin B12 acts in synergy in the formulation of DNA, and deficiencies can have serious consequences,both in performance Horses with a high tissue turnover rate,and in pregnancy and growth of young foals.Clinically the first sign of deficiency is anaemia.Lack of Vitamin B12 can create anaemias. As the deficiency may be indistinguishable for either of these essential vitamins, they are often grouped in one product for therapeutic and preventive use.Vitamin B12 is an essential B group vitamin which is involved in many metabolic processes as an important coenzyme. Its most important role is in the formation of nucleic acids(DNA) from amino acids.Vitamin B12 is vital to the formation of red and white blood cells and haemoglobin, as well as for rapidly dividing cells which include gastrointestinal epithelial cells,the growing foetus, skin and hair. 1. Allergic reactions and allergic disorders with manifestation of acute respiratory signs. 2. Rhinitis,dyspnoea,pulmonary emphysema,pulmonary oedema,asthma and hay fever. 4. Ruminal atony,tympany and bloat in ruminant. 5. Puerperal toxaemia and secondary placental retention,acute septic metritis and gangrenous mastitis. 6. Reactions and other drug allergies and anaphylactic shock. Sheep & Goat : 0.5 - 2 ml. By Intramuscular route. or as directed by veterinarian. Do not use in animals known to be hypersensitive to chlorphenamine. Do not use in rental and hepatic insufficiency. Prevention and treatment of hypocalcaemia , debility , weakness , to improve health productivity and milk yield. eq. dexamethasone Phosphate 4 mg.
Water for Injection B.P. q.s. Treatment of anti-inflammatory or allergic conditions. Horses : Treatment of arthritis,bursitis or tenosynovitis. 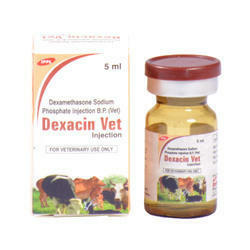 DEXACIN can be administrated by Intravenous or Intramuscular injection in Horses and by Intramuscular Injection in Cattle,Pig,Dogs and Cats. Except in Emergency Situations,do not use in animals suffering from diabetes mellitus,Renal Insufficiency,Cardiac in sufficiency,hyperadrenocorticism or osteoporosis.Do not use in viral infections during the viraemic stage or in cases of systemic mycotic infections.Do not use in animals suffering from gastrointestinal or comeal ulcers,or demodicosts.Do not administer Intraarticularly where there is avidence of fractures,bacterial joint infections and aseptic bone necrosis.Do not use in known cases of hypersensitivity to the active substance, to corticosteroids and to any other ingredient of the product. Tryptansomiasis due to Trypenosoma congolense,T.Vivax and Brucei,Pyroplasmosis due to Babesia bovis,B.bigemina,B.ovis,B.motasi,B.canis,Theileriosis due to theileria annulata. The Recommended dosage is 3.5 mg of Diminazene aceturate per kg body weight as a single Injection which is 5 ml per 100 kg body weight.Do not exceed a total dose of 4 g of active ingredient in any animal (or 56 ml of DIMINACIN). Hypersensitivity to diminazene or phenazone. Administration to animals with an impaired renal and/or heptic function. 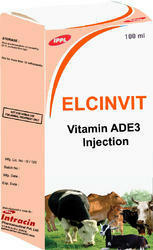 Vitamin E, α-tocopherol acetate 20 mg.
ELCINVIT is a well balanced combination of vitamin A, vitamin D3 and vitamin E for Calves, Cattle,Goats, Sheep, Swine, Horses, Cats and Dogs. - Prevention or treatment of stress (caused by vaccination, diseases, transport,high humidity, high temperatures or extreme temperature changes). Cattle and Horses : 10 ml. Calves and Foals : 5 ml. Goats and Sheep : 3 ml. Swine : 5 - 8 ml. Dogs : 1 - 5 ml. Piglets : 1 - 3 ml. Cats : 1 - 2 ml. Water for Injection B.P. (1:1) q.s. 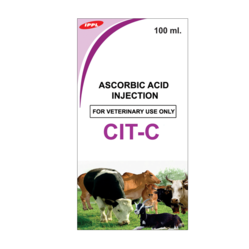 Although the Injectable form of Tylosin is approved for use in Dogs and Cats,it is rarely used parenterally in those species.Tylosin is also used clinically in Cattle and Swine for infections caused by susceptible organisms. Lungworms: Dictyocauius spp. a) 17.6 mg/kg IM once daily.Continue treatment for 24 hours after symptoms have stopped, not to exceed 5 days.Do not inject more than 10 ml per site. Use the 50 mg/ml formulation in Calves weighing less than 200 pounds. b) 5-10 mg/kg IM once daily;not to exceed 5 days. 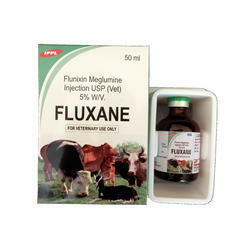 Cattle : For the control of pyrexia and inflammation associated with mastitis, respiratory tract infections,endotoxemia.For the treatment of pain and inflammation associated with musculoskeletal disorders. Horses : For the alleviation of inflammation and pain associated with musculoskeletal disorders.It is recommended for the alleviation of visceral pain associated with colic. Cattle : The recommended dose is 2.2 mg/kg for the antipyretic effect in acute inflammatory conditions in Cattle.Intravenous administration is recommended.The cause of the acute inflammatory condition should be determined and appropriate concomitant therapy initiated. Horses : The recommended dose for musculoskeletal disorders in Horses is 1.1 mg per kg of bodyweight once daily.Treatment may be given by Intravenous or Intramuscular Injection and repeated for up to five days.Studies show that onset of activity is within two hours.Peak response occurs between 12 and 16 hours and duration of activity is 24-36 hours.The recommended dose for the alleviation of pain associated with equine colic is 1.1 mg per kg of bodyweight.Intravenous administration is recommended for prompt relief. Clinical studies show pain is alleviated in less than 15 minutes in many cases. Treatment may be repeated when signs of colic recur.During clinical studies approximately 10% of the Horses required one or two additional treatments. The cause of colic should be determined and treated with concomitant therapy. 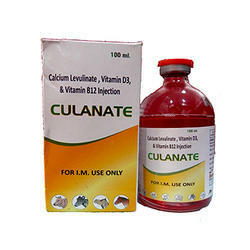 It is used for treatment of congestive cardiomyopathy, pulmonary edema, hypercalcuric nephropathy,uremia and adjunctive therapy in hyperkalemia & occasionally as antihypertensive agent.In Cattle it is used for the treatment of post parturient udder edema & associated structures.In race Horses,it helps to prevent or to reduce epistaxis. Dogs and Cat : 1 ml / 25 kg bodyweight once or twice daily at 6 to 8 hour intervals. Cattle : 0.5 - 1 ml / 50 kg bodyweight. Horses : 0.5 - 1 ml / 50 kg bodyweight once or twice daily at 6 to 8 hour intervals. Do not use the product in cases of acute glomerular nephritis,renal failure with anuria,electrolyte deficiency disease or overdosage with digitalis. Do not use concurrently with aminoglycoside antibiotic treatment. Do not use in Horses intended for human consumption.Treated Horses may never be slaughtered human consumption. Cattle:Meat & Milk : 48 hours. To improve both sprint and endurance performance. Horses : 0.3 mg/kg (5ml/100kg) bodyweight twice daily. Dogs : 0.6 mg/kg (1 ml/kg) bodyweight twice daily. Administer I-CARE by Intravenous Injection. * Muscle levels of Levocarnitine determine the exercise capacity of muscles. * Levocarnitine forms the essential transport system for use of fats as an energy source. * Levocarnitine may help delay muscle fatigue and improve endurance. * Levocarnitine is essential for normal heart function. * Performance Horses recover more effeciently when supplemented with Levocarnitine. Levocarnitine is an amino acid which helps transport fats into muscle cells.Levocarnitine is essential in the transport of fats into muscle cells for production. The muscle levels of Levocarnitine determine the exercise capacity of muscles. By using fats as energy for muscle contractions, the body is glycogen and delaying the accumulation of lactic acid.Levocarnitine delays muscle fatigue by reducing lactic acid formation and improves performance and endurance.Levocarnitine forms an essential part of the transport system which moves fatty acids into the mitochondria(cell furnaces) for energy production. It thus acts as a buffer by inhibiting lactic acid buildup in muscles, helping to delay fatigue and prevent Tying Up.Demand for Levocarnitine in heavily exercising Horses is often not met from the diet, as large amounts are consumed during exercise. Supplementing with Levocarnitine results improved energy supply, increased use of fatty acids as an energy source,decreased lactate buildup and a significant increase in maximum work output. To help reduce the incidence of Tying Up by reducing the build-up of lactic acid in muscle cells. Give 20 - 40 ml by Intravenous Injection(diluted in 1 Litre saline or administer via catheter).Administer once weekly for 4 weeks then discontinue for 4 weeks before repeating the course. 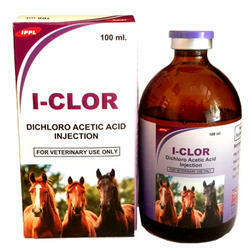 I-CLOR contains dichloroacetic acid, which is an activator of the enzyme pyruvate dehydrogenase. This enzyme plays a central role in the process of lactic acid production during hard work.Supplementation with dichloroacetic acid (DCA) results in activation of the enzyme pyruvate dehydrogenase, leading to a reduction in the rate of lactic levels results in a reduction in pH which contributes to muscle fatigue and decreased muscle performance.Supplementation with DCA has been shown to reduce lactic acid accumulation during exercise, and produce a significant delay in muscle fatigue.The pathogenesis of Exertional Rhabdomyolysis(”Tying Up”) in Horses is related to lactic acidosis during exercise, and associated low muscle pH. Sodium bicarbonate and dimethylglycine (DMG), which may help to reduce lactic acid accumulation during exercise, have been used to assist in the prevention of Typing Up in horses. Similarly, DCA (LACTANASE) results in a reduction in the rate of lactate accumulation, and a delay in the onset of muscle fatigue. 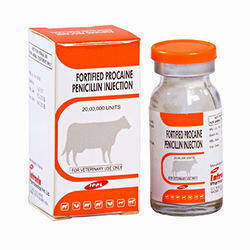 Cattle : Tylosin Injection is indicated for use in the treatment of bovine respiratory complex (shipping fever,pneumonia) usually associated with Pasteurella multocida and Actinomyces pyogenes; foot rot (necrotic pododermatitis)and calf diphtheria caused by Fusobacterium necorphorum and metritis caused by Actinomyces pyogenes. Sheep : Pneumonia,arthritis,contagious and acute agalaxia due Mycoplasma agalactie, mastitis. Goat : Contagious pleuropneumonia due Mycoplasma mycoeides. 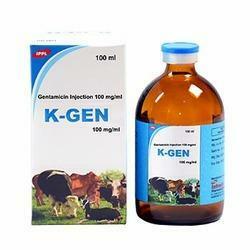 General 1 ml per 10 - 20 kg body weight for 3 - 5 days. Not to be used in animals known to be hypersensitive to the active ingredient. Folic Acid is essential B complex vitamins, vitally involved in many critical metabolic processes related to conenzymes for tissue formation,DNA synthesis, complete utillisation of carbohydrates and proteins for nervous tissue maintainance and energy production and blood counts.Folic Acid acts in synergy in the formulation of DNA, and deficiencies can have serious consequences,both in performance Horses with a high tissue turnover rate and in pregnancy and growth of young foals.Clinically the first sign of deficiency is anaemia.Lack of either folic Acid can create anaemias. As the deficiency may be indistinguishable for either of these essential vitamins, they are often grouped in one product for therapeutic and preventive use.Folic Acid is an essential B group vitamin which is involved in many metabolic processes as an important coenzyme. Its most important role is in the formation of nucleic acids(DNA) from amino acids.Folic Acid is vital to the formation of red and white blood cells and haemoglobin, as well as for rapidly dividing cells which include gastrointestinal epitheleal cells,the growing foetus,skin and hair.Folic Acid is involved in the formation of the amino acids methionine and glycine,as well as the vitamin choline.Folic Acid supplementation is highly recommended during pregnancy, as deficiencies in young growing animals are often associated with retardation.Cooking and storage of feeds destroy Folic Acid levels.When antibiotics, particularly sulphur drugs are used for extended periods, the normal synthesis of folic acid in the gut will be reduced and the requirement for folic acid are increased.Supplements of folic acid are reported to improve antibody respective animal. CLOSIN is used for the control and treatment of internal parasites including adult and juvenile liver flukes (6-8 weeks), and external parasites.CLOSIN is indicated for the effective treatment and control of the following parasites - Gastrointestinal roundworms (adult and fourth-stage larvae),Ostertagia ostertagi, O. lyrata, Haemonchus placei, Trichostongylus axei,T colubriformis , Cooperia oncophora C punctata , C pectinata , Bunostomum phlebotomum, Nematodirus helvetianus(adult only), Napathiger (adult only),Oesophagostomum radiatum.Lungworms (adult and fourth-stage larvae):Dictyocaulus viviparous.Liver flukes (adult and juvenile) (6-8 weeks).Cattle grub (parasitic stages): Hypoderma bois, H lineatum.Sucking Lice: Linognathus vituli, Haematopinus eurysternus ,Solenopotes capillatus. Mange Mites (Cattle scab): Psoroptes ovis, Sarcoptes scabiei var. bovis. 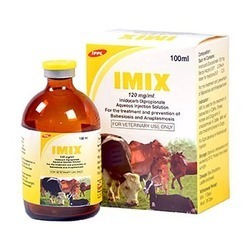 IMIX is used for the treatment of babesiosis in Cattle, Sheep, Horses and Dogs and of anaplasmosis in Cattle. IMIX will also treat ehrlichiosis in Dogs. For Subcutaneous or Intramuscular Injection. Anaplasmosis Treatment of anaplasmosis : 2.5 ml per 100 kg bodyweight, Subcutaneously. administered twice with a 14-day interval. Horses:Treatment of Babesia caballi : 2.0 ml per 100 kg body weight, once daily for 2 consecutive days, Intramuscularly. Meat : 90 days (Cattle). Milk : 21 days (Cattle). The treatment of infections caused by bacteria sensitive to oxytetracycline in Horses,Cattle,Camel,Sheep,Goat,Dogs and Cats. In vitro, Oxytetracycline is active against range of both Gram-positive and Gram-negative microorganisms including Streptococcus spp., Staphyicocccus spp., Listeria monocytogenes,Mannheimia haemolytica, Haemophilus parahaemolyticus and Bordetella bronchiseptica,Chlamydophila abortus (Formerly Chlamydiapasittaci), the causative organism of enzootic abortion in Sheep. Full-grown animals : 1 ml per 10 - 20 kg body weight for 3 - 5 days. Young animals : 2 ml per 10 - 20 kg body weight for 3 - 5 days. Do not administer more than 20 ml in Cattle, more than 10 ml in Swine and more than 5 ml in Calves, Goats and Sheep per Injection site. Do not administer to Horses during concomitant therapy with corticosteroids. A transient swelling may be observed following Intramuscular administration in Horses and Subcutaneous administration in Dogs.The use of tetracyclines during the period of tooth and bone development,including late pregnancy,may lead to discolouration.Photodermatitis may occur after treatment if exposure to intense sunlight.Not for Intravenous administration in Dogs or Cats.It is not recommended to administer bacteriostatic and bactericidal antimicrobials concurrently. in 2-Pyrrolidone Vehicle system q.s. 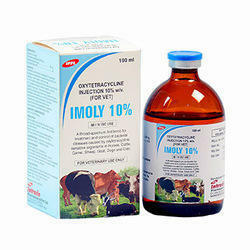 IMOLY 20% is indicated in the treatment and control of disease in Cattle,Sheep and Pigs caused by or associated with organisms sensitive to Oxytetracycline.For the treatment and control of pasteurellosis and pneumonia caused by oxytetracycline sensitive organisms and as an aid in the treatment of infectious bovine keratoconjunctivitis(New Forest Disease) due to oxytetracycline sensitive strains of Moraxeila bovis. This product may also be of value for foul-in-the-foot. General: 1 ml per 10 kg body weight. 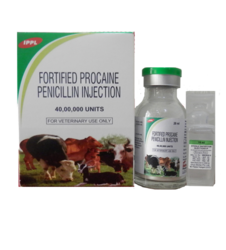 This dosage can be repeated after 48 hours when necessary.Do not administer more than 20 ml in Cattle, more than 10 ml in Swine and more than 5 ml in Calves, Goats and Sheep per Injection site. Not recommended for Cats,Dogs,Horses and Donkeys.The use of this product during the period of tooth development including late pregnancy may lead to tooth discoloration. Milk for human consumption should not be taken during treatment.Milk intended for human consumption may be taken only after 7 days from the last treatment.Not for use in ewes producing milk for human consumption. Animals may only be slaughtered for human consumption after last treatment,according to the below table. 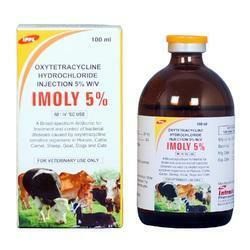 IMOLY 30% is indicated in the treatment and control of disease in Cattle,Sheep and Pigs caused by, or associated with, organisms sensitive to Oxytetracycline. Oxytetracycline sensitive strains of Moraxeila bovis. This product may also be of value for foul-in-the-foot. Pigs: For the treatment of pneumonia caused by Pasteurella. Sheep: For the control of enzootic abortion and pneumonia caused by Oxytetracyclinesensitive organisms. This product may be used as an aid in the treatment of foot rot,acute,severe mastitis and infectious ovine keratoconjuctivitis (pink-eye). Full-grown animals: 1ml.per 10-20 kg. body weight for the 3-5 days.Young animals: 2 ml. per 10-20 kg . bodyweight for 3-5 days. In the treatment of infections caused by Penicillin sensitive organisms suchas Streptococci, Clostridia, Corynebaacteria,Bacillus anthracis and Actinomyces bovis. Large and medium sized animals : Pneumonia, Abscesses,Anthrax,Black Quarter,Calf Diptheria,Foot-rot,Acute mastitis,UTI,Wounds,Postcastration infection etc. Secondary infections complicating canine distemper,Pneumonia,wounds & Feline Entteritis etc. It is contraindicated in animals hypersensitive to active ingredients. - Liver fluke infestations caused by Fasciola hepatica and Fasciolagigantica.Gastrointestinal parasitism caused by Haemonchus,Oesophagostomum and Bunostomum in Cattle,Sheep and Goats. - Oestrusovis in Sheep and Camels. Do not use in animals producing milk for human consumption. Do not exceed stated dose. 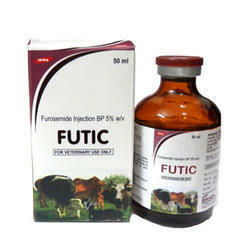 For Subcutaneous Cattle,Sheep,Goats,Camels:1ml per 35 kg bodyweight by Subcutaneous Injection.This dosage may be increased to 1.25 ml per 35 kg bodyweight in case of acute fascioliasis(immature flukes). Dogs:0.30 ml per 10 kg bodyweight by Subcutaneous Injection. The treatment of infections caused by bacteria sensitive to oxytetracycline in Horses,Cattle,Camel,Sheep,Goat,Dogs and Cats. In vitro, Oxytetracycline is active against range of both Gram-positive and Gram-negative microorganisms including Streptococcus spp., Staphyicocccus spp., Listeria monocytogenes,Mannheimia haemolytica,Haemophilus parahaemolyticus and Bordetella bronchiseptica,Chlamydophila abortus(Formerly Chlamydiapasittaci), the causative organism of enzootic abortion in Sheep. Full-grown animals : 1 ml per 5 - 10 kg body weight, for 3 - 5 days. Young animals : 2 ml per 5 - 10 kg body weight, for 3 - 5 days. 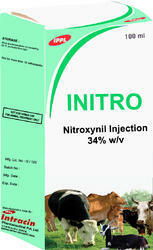 Do not administer more than 10 ml in Swine and more than 5 ml in Calves,Goats and Sheep per Injection site. Do not administer to Horses during concomitant therapy with corticosteroids. A transient swelling may be observed following Intramuscular administration in Horses and Subcutaneous administration in Dogs.The use of tetracyclines during the period of tooth and bone development,including late pregnancy,may lead to discolouration.Not to be used in Sheep producing milk for human consumption.Not to be used in Horses intended for human consuption. In the treatment of infections caused by Penicillin sensitive organisms such as Streptococci, Clostridia,Corynebaacteria,Bacillus anthracis and Actinomyces bovis. Pneumonia,Abscesses,Anthrax,Black Quarter,Calf Diptheria,Foot-rot,Acute mastitis, UTI,Wounds, Postcastration infection etc. Secondary infections complicating canine distemper, Pneumonia,wounds & Feline Entteritis etc. Sheeping fever pneumonia (H.S. ), Pneumonia, Pleuropneumonia, Pseudorinderpestand Urinary Infections,mastitis caused by mycoplasma spp. Respiratory and enteric diseases (Pasteurellosis,Mycoplasmosis,Colibacillosis, Colisepticaemia and secondary bacterial complication during viral infections), Mastitis caused by susceptible microorganisms and renal infection, IROFLOX is effective against the following microoganisms: Mycoplasma spp., E.coil, Salmonella spp.,Haemophilus spp.,Pasteurella spp.,Klebsiella spp.,Proteus spp.,Vibrio parahaemolyticus and Staphylococcus aureus. Do not exceed the recommended dose. In accidental overdosage there is no antidote and treatment should be symptomatic. Subcutaneous use - 14 days from the last treatment. Intravenous use - 4 days from the last treatment. Subcutaneous use - 84 hours(i.e. milkings from the last treatment). Sheeping fever pneumonia (H.S. ), Pneumonia, Pleuropneumonia, Pseudorinderpestand UrinaryInfections, mastitis caused by mycoplasma spp. Respiratory and enteric diseases (Pasteurellosis, Mycoplasmosis,Colibacillosis, Colisepticaemia and secondary bacterial complication during viral infections), Mastitis caused by susceptible microorganisms and renal infection, IROFLOX is effective against the following microoganisms: Mycoplasma spp., E.coil, Salmonella spp.,Haemophilus spp.,Pasteurella spp.,Klebsiella spp., Proteus spp.,Vibrio parahaemolyticus and Staphylococcus aureus. 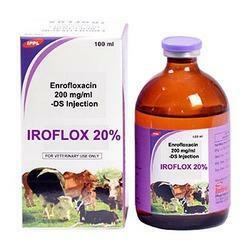 The dose rate is 2.5 mg Enrofloxacin per kg body weight. Meat : Subcutaneous use - Animals must not be slaughtered for human consumption during treatment. Cattle may be slaughtered for human consumption only after 14 days from the last treatment intravenous use - Animal must not be slaughtered for human consumption during treatment. Cattle may be slaughtered for human consumption only after 4 days from the last treatment. Milk : Subcutaneous use - Milk for human consumption must not be taken during treatment. Milk for human consumption may only be taken from Cattle after 84 hours (i.e. milking from the last treatment). For treatment and control of Gastrointestinal nematodes,Lung worms, Eye worms,Warbies and Ectoparasites like mites,ticks and lice in Cattle, Buffaloes, Horses,Sheep,Goats,Camels and Dogs. Cattle : 1 ml per 50 kg bodyweight (based on a recommended level of 200 mcg Ivermectin per kg bodyweight). Swine : Dosage : 1 ml per 33 kg bodyweight (based on a recomended level of 303 mcg Ivermectin per kg bodyweight). For the treatment of Psoroptes Ovis(mange mite), two Injections with a seven day interval are required. Inject Subcutaneously into the neck A sterile 17 gauge 1/2 inch needle in recomended. 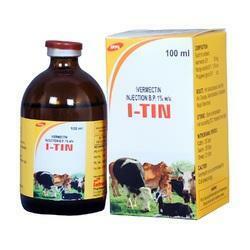 I-TIN should not be used Intravenously or Intramuscularly.Do not use in lactaing Cows or in dairy Cow during 28 days prior to calving. Cattle : Must not be treated within 21 days of slaughter for human consumption. Do not use in Cattle producing milk for human consumption or in dairy cows within 28 days prior to calving. Swine : Must not be treated within 28 days of slaughter for human consumption. Sheep : Must not be treated within 21 days of slaughter for human consumption, do not treat lactating Cows or within 21 days before lambing where milk is to be used for human consumption. 10 ml, 20 ml, 50 ml & 100 ml Vial. For treatment and control of Gastrointestinal nematodes,Lung worms, Eye worms,Warbies and Ectoparasites like mites,ticks and lice in Cattle, Buffaloes,Horses,Sheep,Goats,Camels and Dogs. To be given Subcutaneously Cattle, Sheep, Dog & others small animals 0.5ml per 50 kg body weight. Pig: 0.5 ml per 33 kg body weight. Meat : Animal must not be slaughtered after fast dose for human consumption. Eye Worm : Thelazia app.Ectoparasites (Dermatobiahominis, Psoroptesbovis) Including Sucking Lice, Ticks & Mites. Administration to lactating animals and pregnant heifers within 60 days of Calving. This product is not for intravenous or intramuscular use. 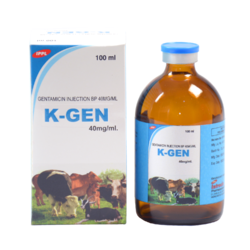 Gastrointestinal,respiratory infections,arthritis,poly-arthritis,meningitis,mastitis & metritis caused by Gentamicin sensitive bacteria,like E.Coli , Pasteurella, Klebsiella and salmonella spp., in Calves,Cattle,Horse,Goats and Sheep. Large Animal : 2-4 mg/kg bodyweight I.M.,I.V. or SC. Small Animals : 1-2 mg/kg bodyweight I.M. or I.V. For intramuscular or slow intravenous injection. These does preferably to be given twice on the 1st day and afterwards once daily. Gastrointestinal,respiratory infections,arthritis,poly-arthritis,meningitis,mastitis & metritis caused by Gentamicin sensitive bacteria,like E.Coli, Pasteurella, Klebsiella and salmonella spp., in Calves,Cattle,Horse,Goats and Sheep. General: Twice daily 1 ml per 20 - 40 kg body weight for 3 days. - For kidneys : 45 days. - For meat : 7 days. - For milk : 3 days. 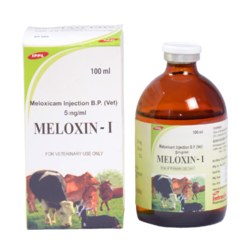 Dog: MELOXIN-I Injection is indicated in Dogs for the control of pain and inflammation associated with osteoarthritis. Cats: For the control of postoperative pain and inflammation associated with orthopedic surgery,ovariohysterectomy and castration when administered prior to surgery. 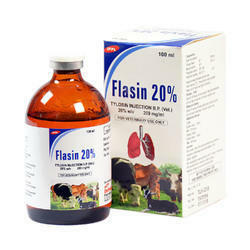 Cattle: For the use in acute respiratory infection with appropriate antibiotic therapy to reduce clinical signs in Cattle.For use in diarrhoea in combination with oral re-hydration therapy to reduce clinical signs in Calves of over one week of age and young,non-lactating Cattle.For adjunctive in the treatment of acute mastitis,in combination with antibiotic therapy. - Treatment of vitamin C deficiency. - Adjuvant therapy for asthenia, notably in cases of infection or stress. Oral administration is preferable for chronic conditions or as an addition toparenteral administration.Orally, the product can be administered on its own, mixed uniformly into feed, or diluted in water (do not mix with milk). CONTRAINDICATION :Do not use in case of hypersensitivity to the active substances or to any of the excipients. Cattle, Sheep ,Goats, Horses : Meat and offal : zero days. Pigs :Meat and offal : zero days. 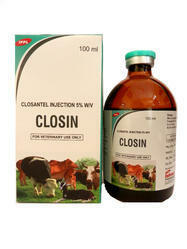 CLOSIN 10 % is used for the control and treatment of internal parasites including adult and juvenile liver flukes (6-8 weeks), and external parasites. 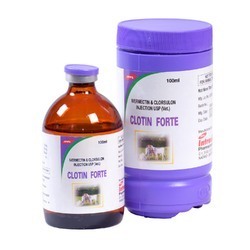 CLOSIN 10 % is indicated for the effective treatment and control of the following parasites - Gastrointestinal roundworms (adult and fourth-stage larvae), Ostertagia ostertagi, O. lyrata, Haemonchus placei,Trichostongylus axei, T colubriformis , Cooperia oncophora C punctata ,C pectinata , Bunostomum phlebotomum, Nematodirus helvetianus(adult only),Napathiger (adult only), Oesophagostomum radiatum. Lungworms (adult and fourth-stage larvae):Dictyocaulus viviparous. Liver flukes (adult and juvenile) (6-8 weeks). Cattle grub (parasitic stages): Hypoderma bovis, H lineatum. Sucking Lice: Linognathus vituli, Haematopinus eurysternus ,Solenopotes capillatus.